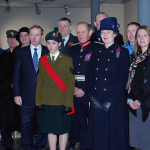 The Taoiseach, Enda Kenny TD, attended a commemoration ceremony in Enniskillen on Remembrance Sunday 2012. 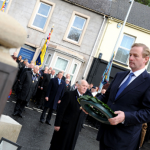 The Taoiseach said he was ‘honoured’ to be a part of the ceremony, at which he laid a laurel wreath. 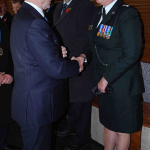 Wreaths were also laid on behalf of the Northern Ireland Assembly and Fermanagh District Council, along with a number of other organisations. 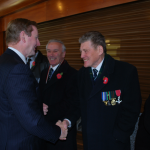 Ballyreagh Silver Band provided the music and led the parade of standard bearers, including those from the Royal British Legion. 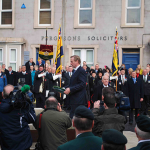 The commemoration in Enniskillen marked the twenty-fifth anniversary of the IRA bombing of the Remembrance Sunday service, in which twelve people were killed, and others seriously injured. 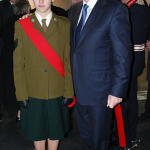 Mr Kenny also attended a service of remembrance at St. Macartin’s Cathedral led by Dean Kenneth Hall. The Rev. 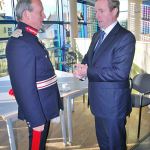 Robin Eames, former Archbishop of Armagh, read the address. 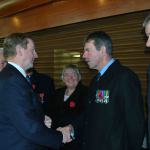 Following the service, the Taoiseach met with families of the Enniskillen bomb victims privately.